The number 20 has a significant presence across Major League Soccer this year. With the addition of New York City and Orlando City to the Eastern Conference, there will be 20 franchises competing for the 20th MLS Cup. It will also be a 20th consecutive season of refereeing at the top level of North American soccer for Professional Referee Organization official Kevin Stott, who received his first center assignment back in the inaugural season of 1996. Stott is the most experienced referee on the PRO roster in terms of games officiated, with 260 to his name, and even has refereeing to thank for meeting his wife, Melanie. “It is very hard for me to believe that I have been doing this for 20 seasons. I never stopped and planned to be doing it for that long, I guess the time has added up much faster than I ever dreamed,” the 47-year-old told proreferees.com. “Without question I still enjoy refereeing as much as I did at the start. I definitely have more appreciation of each match because I clearly recognize that I am reaching the end of my career. “Some of my best memories are from earlier in my career. That first MLS match in San Jose and the goal by Eric Wynalda, for example. Even though I was watching on TV it was history being made. “I will also remember my first MLS All-Star Game at a full Giants stadium, but my best memory – and the one I am still living each day – is meeting my wife through refereeing. Stott, the 2010 MLS Referee of the Year, has been assigned to the Whitecaps versus Toronto game on the first week of the 2015 season. 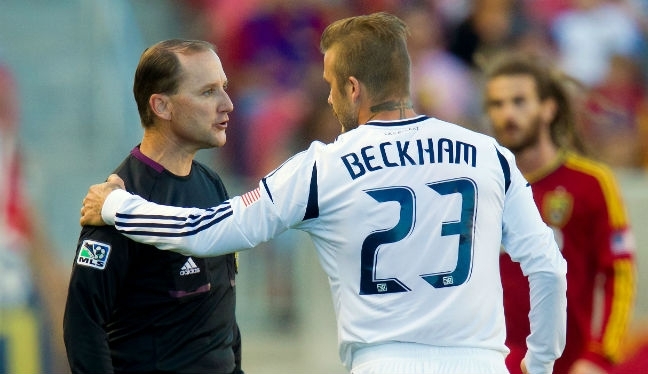 When he takes to the field at BC Place, the Californian will become the first center official to have refereed in all 20 seasons of MLS. Five ARs – Greg Barkey, Chris Strickland, Paul Scott, Kermit Quisenberry and Craig Lowry will also appear in their 20th edition of MLS after another winter of meetings, camps and fitness tests. Based in Chino, California Stott combines his PRO duties with work as a school teacher, and can’t wait to lace up his cleats for another year in an ever-growing league, both in terms of participation and popularity. “It is always exciting in the run-up to a new season, but with New York and Orlando joining, plus a new stadium in San Jose, this will be a great year. “There have been numerous changes over the years. For me, there is more parity amongst the teams, which means every match is competitive. “The soccer-specific stadiums that have been built and having every match televised or streamed live indicates the tremendous fan support. “The same goes for us as referees. In the first year, decisions were not reviewed and analyzed through television coverage and this, along with PRO’s commitment to continuous improvement, has helped progression. “Each of us strive to be our best and get every decision correct so, while this may seem very intimidating, it does mean with MLS becoming more internationally popular, it doesn’t add to the pressure because our objectives stay the same. “I personally want to maintain the highest degree of professionalism that I can. When I believe that I am not, then I will put my whistle down.